Last summer I couldn't help but notice that high street retailers such as Top Shop, Primark and H&M were featuring African inspired fashions in their collections. Whether in the form of bold brightly coloured tunic tops, wooden bangles and accessories, or skirts with African style prints - inspiration from the Motherland could be found everywhere. Without a doubt the interest was well overdue. 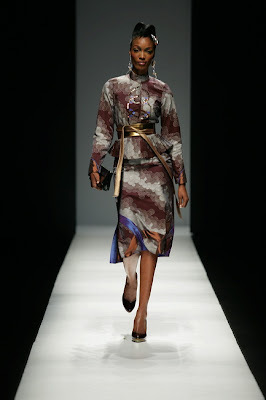 The fabrics, colours, patterns and styles to emerge from the continent are nothing short of breathtaking. Yet for far too long has never received it's fair props. This unprecedented interest also coincides with a new fashion movement from indigenous designers throughout the diaspora who are blazing a trail with collections that utilise traditional African fabrics while incorporating contemporary styling. Over the last few years we've had events such as Kulture 2 Couture, which was paramount in bringing the talents of African designers to the forefront in the the UK. The event was created under the Mayorship of Ken Livingstone, and consisted of a weekend of fashion shows, workshops and seminars. Of course with Borris now in City Hall the official line is the event has been suspended until next year. But hmmm, we'll wait to see how that pans out. However, fear not, on November 29th an event called Kouture Africa is being held at the Barbican, London. The aim of the event is to bring together African fashion designers in a rare fashion extravaganza that will see fashion and clothing as dictated by African aesthetics. There will also be African inspired beauty products, accessories, arts and crafts, and soft furnishings available to purchase. For further details visit www.kouture-afrika.com. I've also been recently notified that an Africa Rocks event is in the pipeline, following in the footsteps of the hugely successful Fashion Rocks, which merges high fashion with music. I'll keep you posted on dates when I receive further details. 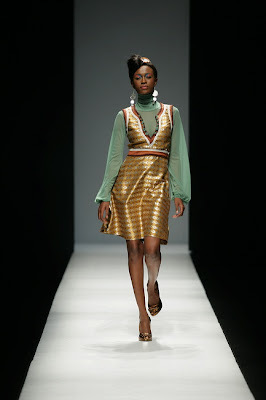 I googled 'Sika Designs'- I love the sleek tailored in patterned Ghanaian jewel tones. So beautifully feminine. 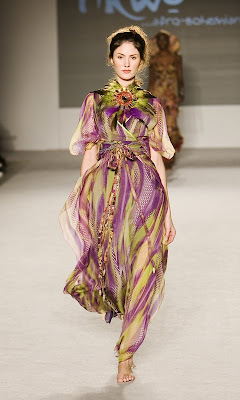 Phyllis Taylor's cute designs are going to be HUGE in 2011. Thanks for the information on Deola Sagoe too.